Here is a little paradox about this most personal of Elgar’s great choral works; its early performances – both the good and the bad – were entrusted to non-British conductors. Indeed, after the infamous debacle of Hans Richter’s first performance in Birmingham it was another German, Julius Buths, who recognising the genius of the work gave it the performance it deserved. Yet since that time, with its popularity and stature ensured within the British Isles, it has struggled for sustained international recognition. If that is true in the concert-hall it is especially true in the recording studio. A far from rigorous examination of the catalogue would seem to suggest that prior to the version considered here there seem to be only two performances conducted by ‘foreign’ conductors; Sakari Oramo in Birmingham and Leon Botstein with his American Symphony Orchestra. Remarkably, neither Leonard Slatkin nor Georg Solti for all their extended catalogues of Elgar’s works have commercially recorded Gerontius. So, all the more reason to want to welcome this new non-British interpretation from an Australian orchestra and chorus with the slight surprise of Vladimir Ashkenazy on the podium. 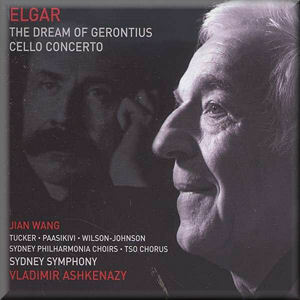 Ashkenazy has no extended history of performing British music let alone Elgar but this disc is one of a series that he has made recently implying some kind of Damascene conversion. It enters a crowded fielded with classic versions from Boult and Barbirolli jostling for supremacy with recent successes from Elder, Davis and Hickox. That is not forgetting the special insights Britten and Pears brought to their version. I really wanted this performance to be an unqualified triumph if only to prove that there does not need to be any special pleading for Elgar, that his music is not parochial and limited. At its best this is a very good version – curiously at either end of the work. In both the Prelude and the closing Angel’s Farewell Ashkenazy finds a perfect sense of solemn majesty with long-breathed phrases lovingly sustained. In the latter he is helped, no inspired, by the singing of Finnish mezzo Lilli Paasikivi. Her performance throughout is the stellar contribution to this recording. Her voice has exactly the right contralto richness with none of the matronly wobble. Her pronunciation is perfect but at the heart of her interpretation is a sense of gentle ecstasy that graces every passage she sings in Part II. David Wilson-Johnson is as safe a pair of hands as might be expected of a singer who has recorded all the major Elgarian roles for baritone. My only surprise was that I do not think he has recorded Gerontius before. I prefer his Angel of the Agony to his Priest – his engagement with the supplicating text of the former is more palpable and he cannot match the likes of Robert Lloyd for Boult for sepulchral majesty in the latter. Mark Tucker in the title role is more of an acquired taste. His biography in the liner focuses on his remarkable career as a singer of major baroque and classical roles. This might imply that the larger romantic roles would find him underpowered at climaxes. This is exactly how it sounds to me here. The quiet reflective passages are quite gorgeous, sung with a beautifully floated tone and complete identification with the text. As soon as Tucker has to ‘fight’ the orchestra the tone hardens, the clarity of the text is swallowed up and a disfiguringly wide vibrato emerges. It is an object lesson in why Boult turned to Nicolai Gedda. The decision was much questioned at the time but the fact remains that many fine British lyric tenors have foundered on the operatic rocks of this role. Many other fine tenors have not dared to try. The Sydney Symphony and their associated choruses play well; indeed the orchestra sound considerably more alert than they do in the coupled concerto. The chorus are well trained and disciplined although they are not as crisp or characterful as some. Although Decca flagged this seems to be an ABC managed recording. The sound is very good in the modern day fashion for rather efficiently anonymous concert-hall engineering. The audience is occasionally audible but not in a majorly distracting fashion and there is no applause. I say efficiently anonymous coming to this recording from a recent bout of listening to classic Decca recordings from the 1950s to the 1970s. There was such personality as well as clarity to those recordings that modern efforts seem well … efficiently anonymous. Try Britten’s take on Gerontius as just one example. This was never deemed one of the great Decca recordings technically but the layering of the choir and semi-chorus, the impact of the orchestra and the general handling of the sound field is so much more interesting before you even begin to debate the actual interpretation. In defence of the ABC engineers I should say that the brass are very well caught as is a pleasingly tummy-rumbling organ. The Dream of Gerontius is an elusive and uneven work and one that is not easy to make work – ask Hans Richter. As mentioned before, Ashkenazy at his best is very good but as a whole I feel he does not yet have the Elgarian idiom fully absorbed. Aside from the overtly Catholic text the elements of the work that disturbed the Anglican-centric sensibilities of the early establishment were the explosions of emotionalism which seemed quite at odds with the English Oratorio tradition and as such ‘not quite nice’. The best conductors understand that this is music that needs to simmer before erupting into the most passionate music any British composer had written at that time. Whether because technically he cannot take the choir with him or the mood eludes him Ashkenazy underplays these eruptions – Praise to the Holiest and the Devil’s Chorus are two of the most obvious examples. I raise the issue of technique because there are several momentary lapses in co-ordination throughout the performance that would seem to indicate a lack of total clarity from the stick. Interestingly, there is very little that is controversial here; an oddly jaunty Be Merciful in Part I and a staid Devil’s Chorus in Part II seem miscalculations rather than anything else. Ashkenazy commendably avoids the greatest Elgarian sin of slowing up before the composer marks a slowing up but conversely he does obsess over some of the textual detail such as giving too much prominence to occasional shortenings of notes which were there to make sure that they were not played too long not extra short! In direct comparison with Oramo the latter is a performance that challenges convention far more blatantly. Whilst I might not agree with every aspect I admire the through-thought and conception there far more than the offering here. If this were not directed by Ashkenazy this performance would not be released as it is; just because it is by Ashkenazy does not mean it should be released as it is. The coupling – placed first on the disc – is another masterpiece, the late great Cello Concerto. This was recorded some weeks before Gerontius and although it seems to be the same technical team the orchestral sound is not as well caught – too prominent trombones and the strings seem recessed although the principal clarinet plays with supreme beauty. These days it is a given that technically any performance will be up to the mark and so it proves here. The soloist Jian Wang is an international soloist with a biography listing most of the world’s major orchestras. For all his competence I find him a strangely unengaging soloist. Again, it is that elusive sense of aching regret expressed through a veil of emotional reserve that seems to elude him and indeed the orchestra. The opening flowing 12/8 theme has rarely sounded so diffident and indeed cool than it does here. Part of the problem is that when Wang tries to inject some passion he runs fractionally ahead of the orchestra [first movement figure 5]. In the second movement he chooses to ignore most of Elgar’s carefully graded pushes and pulls to the tempo, then adds some unmarked of his own and worst of all hares off at a tremendous lick leaving the orchestral strings in his wake. There are moments of beauty – the third movement Adagio can never fail to move but conversely the tear-laden reprise of that material just before the concerto ends is a relative disappointment. Again, the sense of a performance lacking real vision or coherence is inescapable. The concerto need far less ‘special pleading’ from non-British players than the oratorio and has received many fine and famous recordings. This performance does not challenge that list. The liner includes the full text of the oratorio in English only as well as an interesting article linking Gerontius with General Gordon in Elgar’s eyes. Ultimately a rather disappointing set. Oramo proves that there is no ‘secret formula’ to Elgar or indeed any English music that limits its appeal or comprehension to international interpreters or audiences but conversely Ashkenazy’s decided mixed performance proves its no easy ride either. Worth hearing for a magnificent Angel but thereafter only fitfully engaging. Ultimately a rather disappointing set. Fitfully engaging.